Since designing and manufacturing our first forming roll in 1957, we have accumulated know-how for a number of patterns of cross-sections of tubes. Along with a forming machine, high quality forming roll is also essential to manufacture high quality tubes and section steels. We listen carefully to customers' request and endeavor to reply to them in full by making use of our ample experiences and past sales references. A wide variety of products made with our forming rolls such as injection needles, automotive mufflers, door sashes, plumbing pipes, building components, radiator tubes and so on have a high quality reputation in their respective industries. We have designing skill that enables us to reflect customers' requiring cross sections precisely to the products, engineering capability to offer all the processes from preparing materials to the final products and flexibility as we can provide rolls based upon customers' designing rolls regardless of the quantity required. With these functions we can offer high quality rolls in the minimum short delivery time. We have well-experienced designing staff achieving high-level design engineering. We also have some forming mills for test forming purpose which enable us to challenge new cross sections. Use of CAD/CAM shortens designing lead time. All the processes including material cutting, rough machining, heat treatment and surface finishing are handled in house. 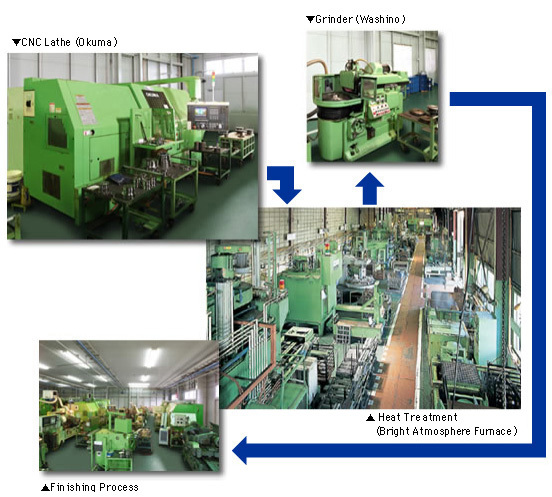 We operate state-of-art heat treatment furnaces such as a bright atmosphere furnace. Our heat treatment engineering based on many years of experience has achieved optimum hardness and wear-resistance of rolls. For surface finishing, we apply lapping after machining with an NC lathe. Depending on an application, super precision finishing is possible with a profile grinder or a wire electric discharge machine. 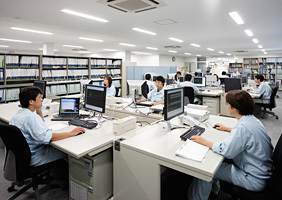 in Okayama (Main Office), Tokyo and Nagoya. Request of regrinding of used rolls is accepted also at these sales offices. CALSONICK KANSEI CORPORATION JFE Steel Corporation KOBE STEEL, LTD.
SUMIKEI COPPER TUBE CO., LTD. SUMITOMO LIGHT METAL INDUSTRIES,LTD. Okajima Pipe Co.,Ltd. DENSO CORPORATION TOYOTA MOTOR CORPORATION Nippon Meral Industry Co., Ltd.
NISSHIN STEEL CO.,LTD. Nippon Steel & Sumikin Metal Products Co., Ltd. Nippon kinzoku co.,Ltd.